On Wednesday, December 5, 2018 at approximately 1:05 a.m., firefighters from North Beach, Prince Frederick, Dunkirk, Huntingtown, St. Leonard, and Anne Arundel County responded to the area of 5th Street, and Easy Street in Owings, for the reported structure fire. The first arriving unit was Chief 1A (North Beach) who found a multi-story single family dwelling with heavy fire showing. A disoriented occupant was rescued from the dwelling by Chief 1A and treated by Ambulance personnel. 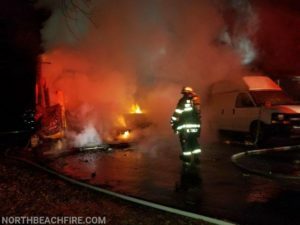 That person was transported to Shock Trauma by Anne Arundel Medic 42 for medical conditions related to the fire incident. 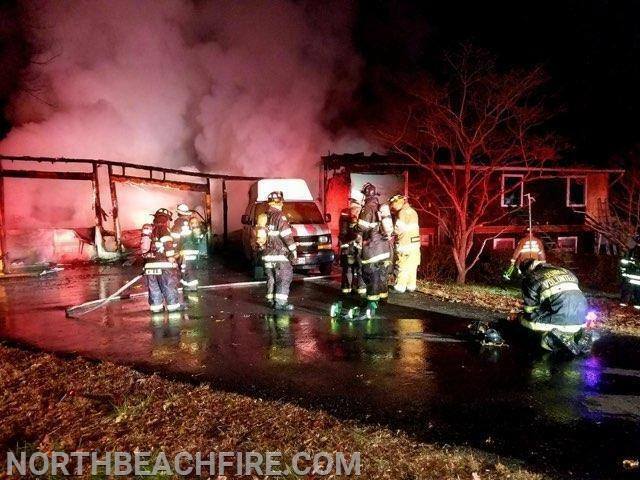 Photos courtesy of North Beach Volunteer Fire Department. This entry was posted on December 5, 2018 at 9:07 am and is filed under All News, Anne Arundel News, Calvert News, County, Fire & Rescue, More News, z 600X120 Top Ad Bottom, z 600X120 Top Ad Top. You can follow any responses to this entry through the RSS 2.0 feed.